Let's be honest: most wrestling gimmicks aren't original. Many wrestlers tend to borrow and outright steal gimmicks from other wrestlers like Ric Flair did to Buddy Rogers, Jesse Ventura did to Superstar Billy Graham, and so on. Even more wrestlers are inspired by movies (Sting with The Crow facepaint), television (Magnum T.A. from Magnum P.I. ), and other parts of popular culture to add more to their in-ring personas. While it's one thing to steal an idea or two, it's another to just rip it off entirely. While there are so many great ripoffs in pro wrestling history, here is a top ten list of wrestling gimmicks that were the most blatant ripoffs of popular culture. Roy Wayne Ferris debuted as the Honky Tonk Man on September 28, 1986 and has never looked back. While he was a parody of Elvis impersonators, he did an amazing job copying Presley's lip curl, swiveling hips, and sequined attire. Sure, he's a blatant ripoff of "The King," but could Elvis hang on to the WWF Intercontinental Title for 454 days? I doubt it. You know your intellectual property is great when not one, but two luchador teams rip it off. Alianza Universal de Lucha Libre (AULL) "created" a new stable of Teenage Mutant Ninja Turtle luchadores called Tortuguillos Karatekas (Karate Baby Turtles/Hatchlings). Around the same time, the International Wrestling Revolution Group "created" the Tortugas Ninja (simply, Ninja Turtles). While doing their best to evade copyright lawyers, the two groups of turtles would wrestle in their home promotions while also taking on each other in cross promotional matches! 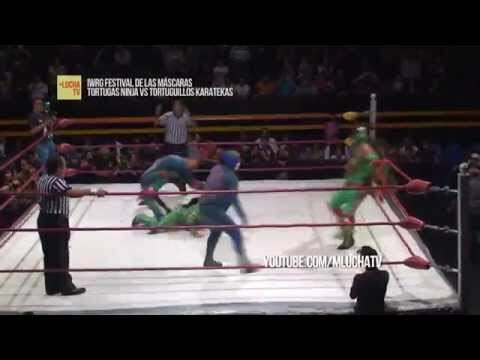 Watching them wrestle is like playing with your TMNT action figures, only instead of the real ones it was the Mexican knockoffs your mom bought at the flea market. When Corporal Kirchner ended his WWF run, he wound up wrestling in Japan's W*ING promotion as the main baddie from the Texas Chainsaw Massacre films. Then he got arrested and jailed for punching a fan. During Kirchner's imprisonment, W*ING gave the Leatherface gimmick to another American wrestler, Rick Patterson. When Kirchner served his time, he came back as the old Leatherface and partnered with the new Leatherface as the new tag team "The Leatherfaces" in the IWA promotion. Say what you want, but this still makes more sense than Texas Chainsaw Massacre 2.